THE READERS RAG: THE TWILIGHT WIFE BY A.J. BANNER: A TALE OF DECEPTION! THE TWILIGHT WIFE BY A.J. BANNER: A TALE OF DECEPTION! On a remote Northwest island, far from the mainland, Kyra Winthrop recovers from a diving accident which has severely damaged her memory. As the days go by, she begins to think that her caretaker husband could be hiding something from her. What could it be? Read and find out! I was very impressed with this book because it was incredibly atmospheric in terms of how Ms. Banner recreated the Island where the drama unfolds. Her descriptions are immensely tactile and visual so that you can plunge right into the scenes as your read them. 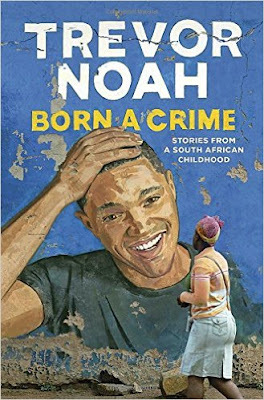 I will admit that I was very pulled along by the story and there were sufficient red herrings that I was unable to figure out where the narrative was going. Ultimately, it became so suspenseful I couldn't wait any longer so around two thirds of the way through I cheated and jumped to the conclusion to find out what happened in the end. Then I reverse read back to where I was. Overall, the experience was very satisfying and engaging and I got a whole lot more than I anticipated when I slapped down my money on a bargain book. A.J. Banner is truly an author of note and the next time I need another good read, I will be purchasing her other book "The Good Neighbor"
I came across "The Twilight Wife" by A.J. Banner when I was doing one of my many tours of the Barnes and Noble store where I do my work. I am one of these people who can't stand exercise and who doesn't like the vicissitudes of the local New England weather. As a compromise, since I know I really need exercise to stay healthy, I make a few tours around the bookstore while I'm there. This involves going up and down every aisle and around every table in the store. At the end of one of the discount aisles near stationary, there was "The Twilight Wife" on a display rack with some books on naval history, the front pages of "The New York Times" from 1851-2017 and boxed sets of Gregory McGuire's four book "Wicked" series, a revision of the history of Oz. I am not sure why they were placed together like that, other than maybe some thoughts about color coordination being more marketable. I've included a picture here so you could see and draw your own conclusions. That was a nice bit of marketing I'd say. Further, in regard to additional good marketing ploys, "The Twilight Wife" in its look and title is quite reminiscent of the novel "The Silent Wife" by A.S.A. Harrison. I am assuming the similar title and book cover was deliberate. The author initials were also a pull, since Harrison did the same, only using initials. Since I loved "The Silent Wife", I was ready to be wowed by any other book that promised to be similar, so I purchased it. Plus, as a somewhat older book--published in 2016--there was a bargain book price to sweeten the deal. "The Silent Wife" is about a woman who is married to a mean, selfish man who is unfaithful to her, and it is about how she ultimately exacts revenge from him in a darkly satisfying manner. 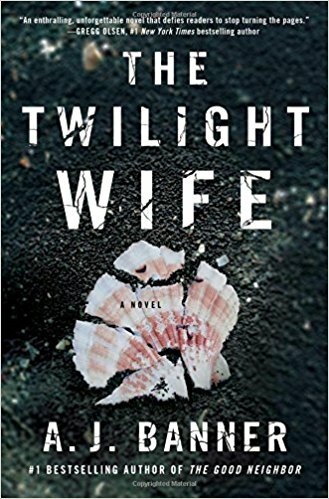 "The Twilight Wife" is on the same level, all about a woman who is married to a deeply suspicious man who appears cloyingly solicitous, but somehow fundamentally untrustworthy. Add to that, the woman in "Twilight Wife" had a serious diving accident which has wiped out her memory of the last four years of her life. Although she has occasional flashbacks and fragments of the past swim up to her consciousness, she is unable to make any sense out of them. Thus, "Twilight Wife" is a book that, along with "The Silent Wife", calls to mind a very thrilling book entitled "Before I Go to Sleep" by S.J. Watson, another initialed author. The Watson book is about a woman who is unable to retain her memories from one day to the next who is also married to a solicitous man who, like the husband in "The Twilight Wife" comes across as greatly untrustworthy, if not dangerous. Here, I don't want to get into spoilers, but this is what is going on! I'm beginning to wonder whether there should be some kind of mutual coordination going on between the publishers and writers of these three books. Each of these books--"The Silent Wife", "Before I Go to Sleep" and "The Twilight Wife" stand together as a series of three whose themes and content complement and overlap one another under the banner of woman marries deceptive and fraudulent man and seeks to free herself. "The Silent Wife' and "The Twilight Wife" particularly stand together because of their similar titles and book covers--the black tones combined with the white print. 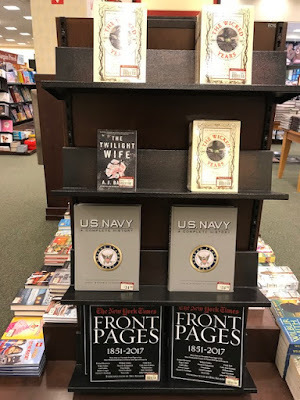 I would definitely read all three together because each book provides a different perspective on the very similar these of the married woman with the unreliable husband. "The Twilight Wife" has some additional goodies at the end, i.e. a list of book club questions for discussion, and an advanced list of questions for those who wish to explore the book even further. It also includes an interview with the author which gives you the opportunity to learn more about her background and writing process. Let me tell you a little bit about the author. She was born in India, but grew up in the United States. She received her education and the University of California, Berkeley. Plus, she lives in the Northwest with her husband and five rescue cats. The book was published by Touchstone, which is an imprint of Simon and Schuster. The interior design of the book was done by Jill Putorti. What I like about what she did is that she inserted a blank page in between many of the chapters. This enhances the subtle feel of the book as if it were a movie where each scene is distinctively independent of the other, separated by a moment of silence. That adds to the sense of the fracturing of the narrator's mind, as if it is jumping from one experience to the other, perhaps failing to discuss those scenes or experiences her mind is unable to retain in her memory. So the physical structure of book's interior expands upon and comments upon the story itself in a very subtle and complex way. Lucy Kim did the cover design for the book. I do think the imitation of the cover design for "The Silent Wife" was a very smart move on her part. I also like the splintered look of the print and the sea shell on the cover which appears to reflect the fractured condition of the protagonist's mind and is a subtle comment on her profession as a Marine Biologist. For those who are interested, A.J. Banner is represented by Paige Wheeler who is the founder of the New York based Creative Media Agency, Inc., and who has had 20 years in the business. In 2006, she was a founding partner of Folio Literary Management, LLC. For the better part, Paige Wheeler appears to work on cosy type mysteries and light romance, and many of her authors have won awards. I am not particularly familiar with any of the authors she represents which, I guess, says a great deal about my reading habits! I have a feeling that my tastes tend to lay with the deep, down and dirty. A.J. Banner has two books which will be forthcoming fairly soon, and when they are published I will definitely make sure I read them.